I've always wondered what the difference between the two is, and sometimes (games, movie players, etc), you are given a choice of mono or stereo sound. I toggle both but don't hear any difference. So, how do they actually differ? The difference is in the number of channels (signals) used. Mono uses one, stereo uses more than one. In monaural sound one single channel is used. It can be reproduced through several speakers, but all speakers are still reproducing the same copy of the signal. Here is an example using a two speaker setup. More technically, true stereo means sound recording and sound reproduction that uses stereographic projection to encode the relative positions of objects and events recorded. 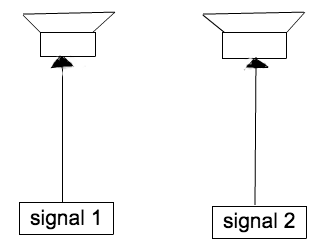 In a common stereo setup of two channels: left and right, one channel is sent to the left speaker and the other channel is sent to the right speaker. Now, by controlling to which channel you send the signal you can control the position of the sound. You'll hear sounds coming from different directions depending on which speaker you send the signal to, or in which proportion (you can send just a little more to the right speaker, so the sound is positioned just a little bit to the right). Sounds with equal proportions on both speakers will appear to come from the center. In other words, stereo opens the possibility of playing with sound localization. Since we have two ears, on opposite sides of our head, we hear a particular sound from two directions.Each takes a slightly different time to arrive, so we have a good idea where the sound is coming from.To record this stereo sound, two mics(at least) are used.Actually, the best theoretical position for these two mics is at 180 degrees away from each other - just like our ears. In a situation where, say, a band is playing, sound will come from lots of different directions, so several mics can be used, and the position in the mix - pan- can be moved using the recording desk. When you listen to something in stereo with headphones, you can imagine where the guitarist is playing, inside your head.Often, the vocals are dead centre. Obviously, the effect is similar using speakers, but it's easier to appreciate where things are in a mix using cans. With mono, there is no spaciality. The sound in each ear is identical. It can be recorded with just one mic. The concept came about when someone listened to recordings that were done with the mic in different places, and he realised that two mics would 'hear' two different mixes. The best way to check if a recording is stereo is to hear applause. It's very obvious whether it's mono or not. Surround sound takes this idea further. Basically it used a delay to make the sound appear to come from farther away, but with 7 points now, it's achieved using 7 different positions for the mics, which are amplified with 7 different amps and speakers, spread round the room. The most basic definition of mono or stereo is simply that with stereo you receive information in one ear that is somewhat different to information received by the other. With mono audio your ears are receiving 100% of the same information. Early stereo pop singles are quite interestingly and idiosyncratically mixed. For example 'King Midas in Reverse' by the Hollies has the vocals on the intro mixed 100% in the right channel. If you isolate the left channel you can hear a pleasant instrumental version of the same track. Early producers working in stereo often placed the bass and drums, often relegated to a single track on a 4-track tape, to one channel. 'I Feel Free' by Cream has the roar of the band placed in one channel, and the vocals and tambourine overdubs placed in the other. By the end of the '60s it was more commonplace to place the drums and bass in the centre of the mix and then subtly pan the vocals, and less subtly pan the guitars, keyboards and other instruments, in a bid to reproduce the spatial layout of a band onstage. While mono is sometimes seen as the poor cousin of stereo, producers such as Joe Meek were able to commit powerful and lucid mixes to tape in mono. There are some stereo recordings that pretty much require some form of electronic analysis to demonstrate that they are stereo. Classical performances captured by overhead microphones, no more than a couple of feet apart suspended over an orchestra the width of a concert stage, don't tend to have lively stereo mixes. The two microphones will pick up their subtly different locations with regards to certain instruments, but the effect isn't to produce a jarring or vivid stereo image. Having said that again some early stereo classical records were produced so that 'sparring' instruments were placed at opposite sides of the stereo image. Finally, if OP isn't hearing any difference between switching from mono to stereo then he could be experiencing a hardware issue somewhere, and legitimately isn't being presented with different audio upon making the switch. Speaking personally, the rather desultory soundcard in my laptop isn't capable of recording incoming audio in stereo, but recording software doesn't know this and will happily record the same incoming audio to two separate audio tracks. I would be surprised if a soundcard could only output mono audio, but a cursory Google reveals people reporting this exact problem. As we almost do only have 'Stereo-Sound-Systems' to our disposal I'll make a little add-on with a totally practical approach. 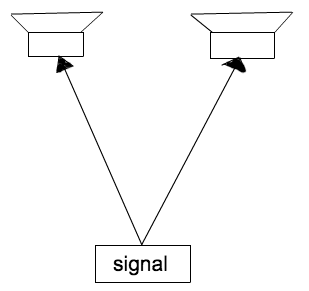 On a two-channel-system like stereo (L/R) MONO simply means that the signal of a mono-source like a mono-microphon is distributed with the same level to both channels/speakers. When a listener at a certain distance is sitting exactly in the center between the two speakers, the mono signal will appear to be exactly in the middle of the plain between the two speakers. Headphones leave you no choice. You are always in the middle! Panning your signal either to the left or the right just means you are changing its position in the L/R sound-field but the signal is still mono. The experience of listening to music in mono from a speaker, eg. that of an old table radio, versus headphones is completely different. When a speaker is projecting into a room, the sound is reflected off all the surfaces in the room, so there is still a sense of space and presence. When a mono signal is piped into headphones, the sound all seems to be coming from the center of the skull (as Consumer Reports described it many years ago) an effect which I find drab and lifeless. Why do I feel like I sound really bad when I'm playing Guitar?